The world's most famous boy reporter with a trademark quiff set foot in India only twice. 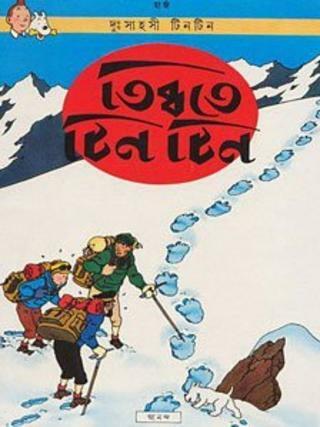 In Tintin in Tibet, one of Herge's most elegantly drawn albums, the intrepid Belgian scribe arrives at Delhi airport en route to Kathmandu and a new adventure. I remember spotting what I believed was a tiny, but significant mistake in the opening panel during my many re-readings of the album. Tintin, along with Captain Haddock, Snowy and a host of other passengers - including a woman in a purple sari and green blouse! - disembark from a plane bearing the registration number VT DAO loudly on its wing and sides. I then checked up India's airline registration records and found that the number belonged to a Seagull II hang glider owned by a sugar factory! I nitpick because I am an incurable Tintin fan, and one of the many things that drew me to his adventures was Herge's meticulous artwork and nagging attention to detail. After the opening faux pas, however, Herge fares exceedingly well, taking Tintin and his friends to the Qutub Minar and the Red Fort - two Delhi landmarks - that are etched out in fine detail and rich colours. Then he makes them wade through a busy bazaar in what looks like the old city, peopled by loin-clothed turbaned men, wiry and harassed-looking policemen and ragged children. Somewhere in between an angry cow takes Captain Haddock for a ride. In the end, a Sikh taxi driver races through empty streets to take them to the airport, where an Air India plane waits. Not bad at all, and actually, fairly authentic. Michael Farr, a leading British 'Tintinologist', says Herge actually did a "lot of research" for Tintin's Indian journey: he secured catalogues of all the aircraft Air India used and uniforms the cabin crew wore at that time. Less inspiring is Tintin's other trip to India. In the otherwise riveting Cigars of the Pharaoh, the brave reporter crashes his small plane in the jungles of India. He meets a mad fakir, and escapes from a mental asylum. There is a journey on a train bound for "Sethru-Jamjah" - a Google search took me to an African gem shop by that name! Irate villagers catch Snowy chasing a cow and decide to "slay" him at the "altar of Siva". There are scenes of a railway station with a neat Indian Railway poster. All this happens in the ridiculously named kingdom of the Maharaja of Gaipajama, which translates literally into the "king of a cow's pyjama"! The India in Cigars of the Pharoah is utterly unreal and stuffed with awful caricatures. Still, Indians love Tintin like no other comic book. In an age of dashing, computer generated comic book heroes, Tintin albums - in English and in Bengali and Hindi translations - continue to sell by the thousands. Is it any surprise then that Steven Spielberg's paean to the intrepid reporter, The Adventures of Tintin: The Secret of the Unicorn, releases in India later on Friday, six weeks ahead of its US release? "Tintin is huge in India, perhaps bigger than in the US," says a spokesperson for Sony Pictures (India), which is releasing the film here. She says their research shows that more than 90% of the audience that watch Hollywood films in India are Tintin fans. Amazing. A Bengali children's magazine, Anandamela, brought Tintin to India in a local language for the first time in the mid-1970s. I remember reading excitedly the magazine owner Aveek Sarkar's account in the magazine about his trip to Brussels to meet Herge and persuading him to give him the rights to translate Tintin into Bengali. The Bengali Tintin was an instant hit. By 2004, Anandamela had finished translating and serialising the 23 comic books. In the mid-1980s a local publisher began printing the comic books. Since then it has reportedly sold around 500,000 copies of each adventure! "Bengali Tintins are a part of every Bengali child's growing up. Our books are everywhere, in all book stores in Bengal," the chief of Ananda Publishers told the Mint Lounge newspaper. Bringing Tintin to Hindi-speaking readers was more difficult, and didn't happen for another two decades. In 2005, Ajay Mago, owner of Om Books International, approached Casterman for the Hindi translation rights. The negotiations lasted for two years, during which the publishing house sought samples of Hindi translations. Mr Mago spoke to several translators before opting for advertising professional, Puneet Gupta. "It was very important to us to zero in on a translator who lived, ate, dreamt and breathed Tintin," Mr Mago told me. "The main criterion for selecting the translator was how passionate he was about Tintin. The second criterion was how good was he in Hindi. The third criterion was how willing the translator was to take inputs from the French Tintin comic books." "But the litmus test was how well a translator could translate [Captain Haddock's signature abuse] 'billions of blue blistering barnacles'! Puneet Gupta fitted the bill. Since Tintin launched in Hindi last December, Mr Gupta has translated 16 books. "The response has been amazing," says Mr Mago. He claims to have be selling close to 2,000 copies of each album - "people who have run Tintin in English now pick up the Hindi editions, and lot of foreigners too". It helps that the Hindi album costs less than half the English one. So Indians remain mad about Tintin. There are Tintin fan clubs, and an octogenarian Calcuttan runs an eatery called Tintin Economic Chinese Restaurant, which serves a Tintin chow mein and fried rice. I don't know what Herge would have made of all this. Meanwhile, I'm off to watch the Tintin movie.